Seattle has over 90 unique neighborhoods. 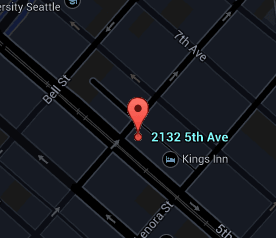 The location of Fifth Avenue Court is in the area known as Denny Triangle. Located on the edge of Belltown and Seattle's Retail Core, the attractions are endless near the Fifth Avenue Court. Great shopping, dining and entertainment are happening right outside the front door any time of day. Westlake Center, Macy's, Pacific Place, Nordstrom are all within minutes of the building. Dine at the Dahlia Lounge or the Clever Bottle and try their Market Plate and goat cheese truffles and check out their endless list of cocktails. Just a few things you can do in the neighborhood. Every building has its own personality and attributes. The community is an important aspect of city living and can have an impact on how integrated it is with the residences. The Fifth Avenue Court building features can be explored here. A full list of amenities within the complex is displayed to help understand the offerings of the project. Boasting what must be of the highest WalkScores in Downtown Seattle (99! ), Fifth Avenue Court is one of area’s classic gems. This boutique, 32-unit, masonry-style buildings is located in the heart of Belltown. A secure entrance opens up to a classic, marble-lined lobby with a wide staircase. Fifth Avenue Court was built in 1922 but it was refurbished in 2007 and today it artfully combines the charm of the past with modern conveniences such as granite countertops and updated cabinetry. While all of the units feature studio and one-bedroom floor plans, no two homes are exactly the same! Steps away from iconic Top Pot Donuts, new Amazon headquarters and Downtown Seattle’s shopping core. All active, contingent, pending, and sold listings for the Fifth Avenue Court building. The Stroupe Group specializes in downtown Seattle condominiums. All the articles that have been published by the Stroupe Group concerning Fifth Avenue Court and Denny Triangle can be found here.